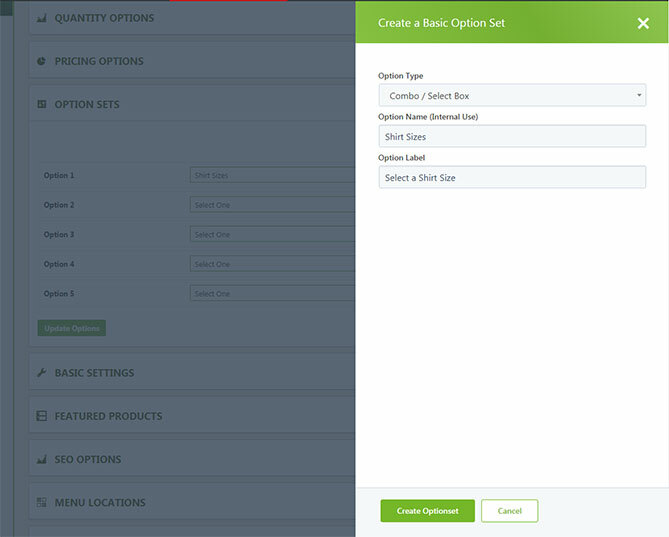 Option sets allow you to attach choices that your customer can choose from to each product. Two types of options exist; basic options which you are allowed to have 5 per product AND they can track individual quantities as well as use option item images; OR you can have unlimited advanced options which offer more flexible choices such as text input boxes, check boxes, file uploads, and much more. Before you can add options to a product, you must first create the option set and individual choices in that option set. This can be done directly from the product using our slide out editor. Clicking the ‘Create New Option Set’ button will open a slide-out panel based on if you have selected advanced options or not. For additional option features, please refer to that section by clicking here. First create the option set. This is a kind of container in which you choose the type of option to use. Do you want a combo box or swatches? Swatches are icons a user can click and a combo box is a select box the customer can choose one option from. Once you do this you can enter option items one at a time. The best example of what you are building is first saying I want to give my product multiple sizes. Second you tell the EasyCart what sizes you are selling. Option sets can be re-used if you have similar products. Now you can create your option items. Click create and add another to create lots of option items, create and close to be done, or just click the X in the top right to end the process without creating another option item. To attach basic options, simply be sure that the ‘Use Advanced Options’ is unchecked. You will have 5 available slots to add basic options to a product. To attach advanced options, simply be sure that the ‘Use Advanced Options’ is checked. 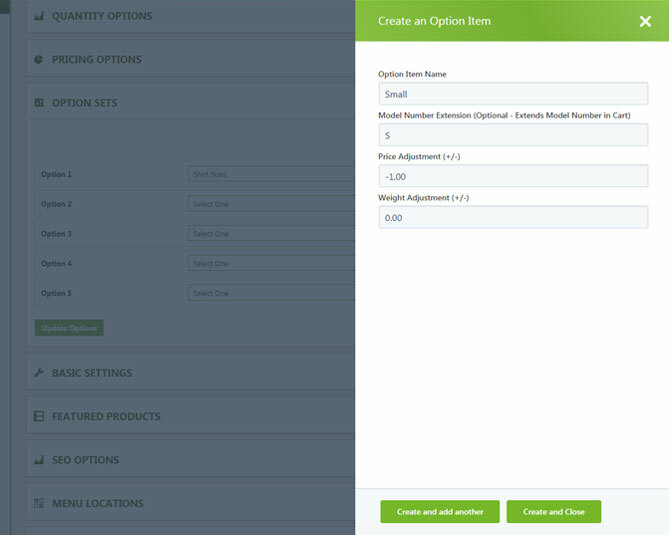 You will be able to add unlimited options to a product with advanced options. They will appear on the product in the order you attach them here. Note: Advanced options are usually the best choice to use, unless you need to track individual option quantities, then you must use basic options. Advanced conditional logic is available in our Professional/Premium editions and gives you the ability to enable this logic on a variety of option sets. Perhaps you want one set of options to appear and drive one set of options, this is all possible with our advanced option logic. 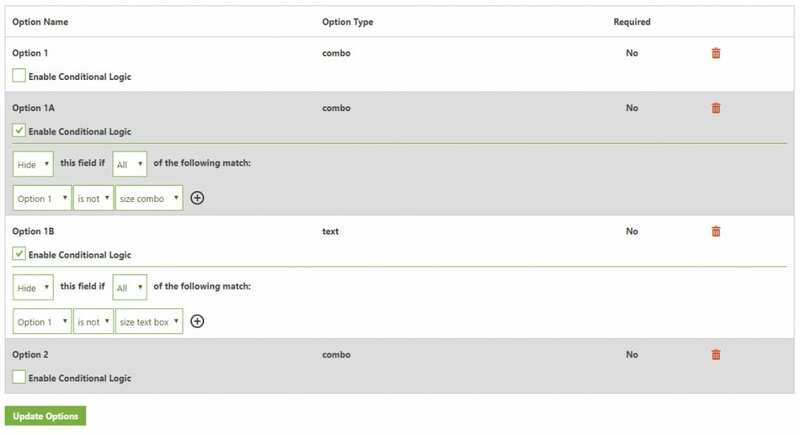 Just enable your option logic, choose your options to show or hide a field based on certain conditions from a previous option set.